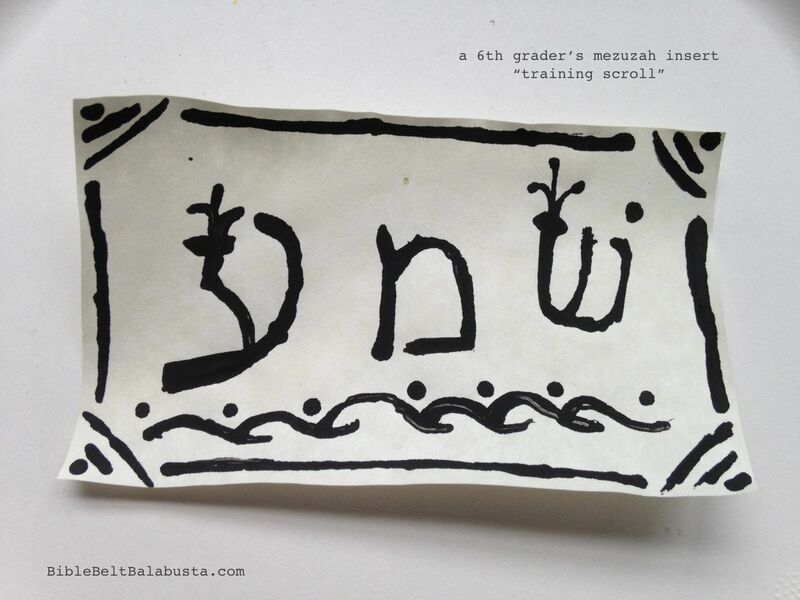 Make a Mezuzah “training scroll” with your kid (or a whole class). Making a DIY (do-it-yourself) mezuzah is fun way to spend Jewish time together, and you end up with a ritual object ready to use. WANT TO MAKE A SCROLL? See below for free printable templates and instructions on how to create “training scrolls.” Ages: toddler to teen. WANT TO MAKE A CASE? See Make a Mezuzah pages for ideas on how to craft cases from free, found materials. Individual projects include: Lego Mezuzah, Glue Stick Mezuzah, Matchbox Mezuzah, and Marker Mezuzah. Show a real scroll for reference, if you have one. The scrolls are fascinating in themselves: little works of art, faith and tradition. 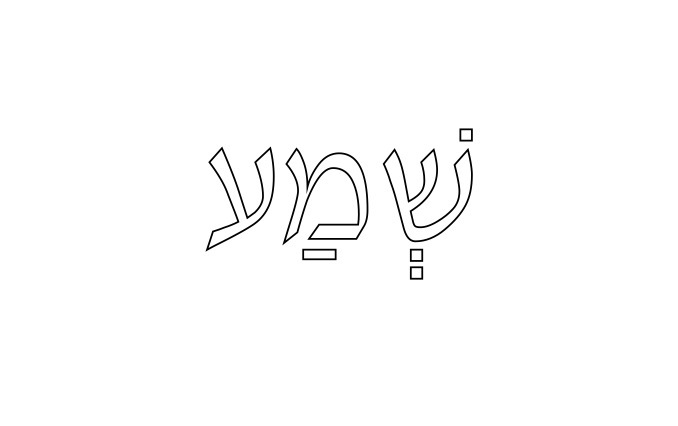 On the outside of the scroll should be the letters that spell Shaddai (Almighty) with a lovely crowned Shin, and then, upside down are a string of letters that are actually a kabbalistic cryptogram. The scroll is always rolled from left to right, so that when it is unrolled, the first word seen is Shema. 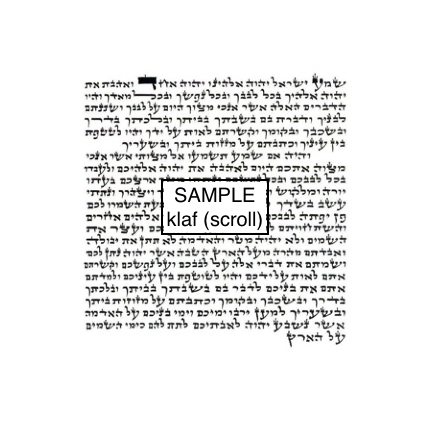 You may buy a kosher scroll at judaica shops, synagogue bookshops and online. Below are DIY ideas for making a “training” scroll with kids ages Toddler on up. By training, I mean a non-kosher scroll that nonetheless provides an opportunity to learn about mezuzot. If your doors already have the kosher kind installed, a kid-crafted mezuzah can be mounted lower, within reach of the youngest members of the family. See Make a Mezuzah page for mounting instructions. Size: traditional scrolls range in height from 6, 10, 12 and 15 centimeters. Keep the relative sizes of the scroll and the case in mind while you create. CHOOSE A VERSION BELOW, depending on the age of your child and the time at hand. 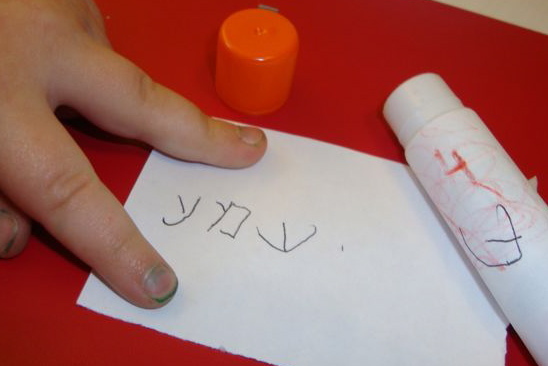 The skills required range from simple coloring or matching letters, to writing one word or a whole phrase. Finish any of these methods by rubbing the dry, decorated scroll with the side of a light beige or ivory crayon to give it a parchment look. Or, start with a parchment-y paper like vellum. 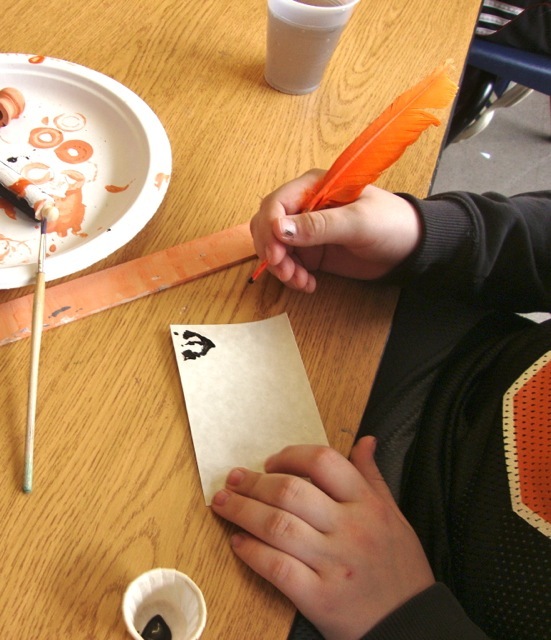 Older kids can use a calligraphy pen with black ink, or an actual feather quill (for feather info, see #4 below). Trace and color the letters. Use narrow black marker or colored pencil. Fill in with black or other colors: narrow markers, crayons, colored pencils or crayons. Materials: Buy Hebrew rubber stamps and Alef-Bet stickers at OyToys.com and Benny’s Educational Toys. Crafts stores carry feathers, black tempera (my favorite medium for DIY scrolls) and individual sheets of interesting papers (in the scrapbooking section). Sofer: The Story of a Torah Scroll , by Eric Ray. A real sofer shows and tells his work. Ages 4-8, but appropriate even for adults. The pages on making real mezuzah scrolls are a helpful visual guide. Mezuzah on the Door (Jewish Identity) , by Amy Meltzer (a PJ Library picture book selection). HaSoferet, the site of Jen Taylor Friedman, the modern world’s first female Torah scribe (and the originator of Tefillin Barbie and other marvels). Here’s the link to the Mezuzah page, in which she recommends particular vendors, shows us now not to hang a mezuzah, and advises how to make a mezuzah case out of an empty Rolo candy tube. Mezuzah.net: Ask the Sofer. See the long list of actual mezuzah questions answered, and submit your own if you need to. Your question is probably already there.